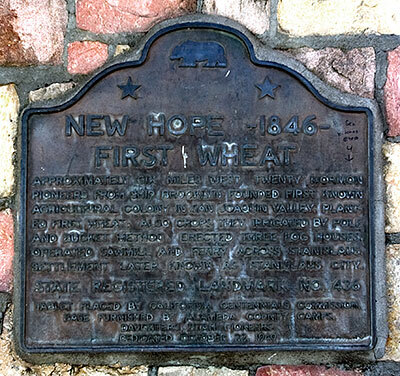 Approximately six miles west twenty Mormon pioneers from ship Brooklyn founded first known agricultural colony in San Joaquin Valley, planted first wheat. Also crops they irrigated by pole and bucket method. Erected three log houses. Operated sawmill and ferry across Stanislaus. 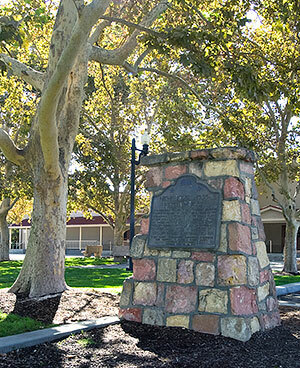 Settlement later known as Stanislaus City. California was still Mexican territory when the Brooklyn set sail from New York harbor on Feb. 4, 1846, carrying 238 Mormon pioneers. Ten would die - and two would be born - on the epic six- month journey around Cape Horn. Some Mormon historians believe that Northern California - not the basin of the Great Salt Lake - was to be the new Mormon mecca, the place where "the Saints" could practice their controversial religion and polygamous lifestyle in peace. Following the murder of their founder and fears of further persecution, these "exiles from a wicked land" renounced their allegiance to the United States and secretly planned to meet up with an overland party organized from Nauvoo, Ill., by Mormon prophet Brigham Young. Sailing through the Golden Gate, Brannan squinted through the summer fog at his new home, reportedly muttering, "There's that damned flag again."